Poland is one of the European Union’s most rapidly developing countries. Poland's strong and robust position on the Old Continent's market makes it possible to intensify the country's business expansion and activities in Latin America as well as in the United States. According to the IMF; World Economic Outlook Database of April 2013, Poland is ranked sixth among European Union’s and 23rd among the world’s largest economies with regards to the GDP. Poland is a large sales and consumer market, open and ready for commodities and services. The 38-million population of Poland accounts for 37% of all new European Union's member states' community. The GUS [Poland's Central Statistics Office] and Eurostat data show that in terms of 2013 economic growth, Poland was ranked fifth among the 27 EU countries, after Latvia, Lithuania, Malta and the United Kingdom. International institutions, including OECD and the European Commission expect that in 2014 Poland's economy will grow at the pace of 2.7 percent. to 3.6 percent year-to-year, and in 2015 at least 3.6 percent. Poland's major trading partners' list includes: Germany, Russia, China, France, Great Britain, Italy, Hungary, Ukraine and Spain. World-scale companies choose Poland as their destination for new investments in Europe. As stated in the Bloomberg ranking, Poland comes 17th among the world's fastest growing economies. According to the latest FDI Intelligence ranking of Europe's best cities and regions in terms of appeal for foreign investments, Poland has repeatedly been quoted among the leaders. In the foreign investors' perspective, Poland is Central and Eastern Europe's most attractive place to launch new projects in. The latest Ernst & Young’s European Investment Attractiveness Survey 2014 holds it that Poland comes first in Central and Eastern Europe and third on the whole continent in terms of the number of jobs generated in relation to direct foreign investment in 2013. Poland is located in Central Europe in the Vistula and Oder basins. In the north the country borders with the Baltic Sea, in the south it stretches as far as the Carpathian Mountains. Poland's administrative area is 312 679 km2, which gives it 70th position in the world ranking and 9th in Europe. Poland, with its population of 38.5 million is ranked 34th in the world and 6th in the European Union. Germany is Poland's neighbour in the west, in the south these are Czech Republic and Slovakia, in the east Ukraine and Belarus. Poland is bordered by Lithuania to the north-east and Russia to the north. The substantial part of Poland's northern border runs along the Baltic Sea. Poland's exclusive economic zone on the Baltic Sea is boarded by Denmark and Sweden. Poland enjoys a truly favourable location right in the heart of the Old Continent and at the junction of the major traffic routes, which makes the country a perfect place to export from to all European countries and thus target over half a billion consumers. Poland is an excellent place to invest, run and develop your business. The international reports emphasise Poland's economic and political stability, availability of educated and competent staff as well as a large internal market. Year after year foreign entrepreneurs report a more positive feedback on the investment climate. Stability and security is guaranteed with Poland's membership in NATO and the EU; thus Poland is regarded a reliable and an important business partner for foreign investors. In Poland there are 14 Special Economic Zone (SSE). SSE are specially designed business-focussed areas which offer preferential terms for running businesses. SSE offer new investors attractive tax incentives, new-employment facilitation as well as well-prepared investment areas. ITC companies, research and development centres and scientific institutions find Polish specialists and scientists highly valued employees owing to the fact that they are well educated and skilled. In Poland there are 453 Higher Education Institutions including 25 universities of technology and 76 schools of economics. The number of HEI graduates increases year after year; among the employment market newcomers there are professional the companies which invest in high-tech business sectors look for. Poland is a part of the global tourism market and enjoys a constantly growing number of visitors. Poland's accession to the European Union has even reinforced this trend. According to the Activ Group calculations commissioned by the Ministry of Sport and Tourism , in 2013 there were 72.3 million foreigners to visits Polish, which accounts for 8.8% compared to the previous year. Out of this number, the estimated 15.8 million are tourists (6.8% more than in 2012.). Poland's most popular cities are Kraków, Wrocław, Gdańsk, Warsaw, Poznan, Lublin, Toruń and Kielce. Kielce (the population of 201 000 inhabitants) is the city located in the south-east of central Poland, the Świętokrzyskie Voivodeship's capital, For a number of years the city has been ranked among most investor-friendly places. In 2013 it was put on the short list of the prestigious Poland Outsourcing and Shared Services Award. Kielce's favourable location in the heart of Poland makes it a perfect venue for exhibitions and conferences. Not only is this a splendid place for domestic companies, but also for companies from the neighbouring countries. Targi Kielce has proven to be a leading city-forming factor – Targi Kielce's business activity has largely contributed to the development of the City's and the Świętokrzyskie Region's trade fair-related and business-tourism infrastructure. In addition to the new hotel facilities (guests calling in Kielce have at their disposal almost 7,442 beds in 2** to 5** hotels), new restaurants, clubs, sports and entertainment centres, taxi corporations and transport services companies have also proliferated. The Grono Targowe Kielce [Kielce Expo Cluster] operates in conjunction with Targi Kielce. This is the first Europe's expo cluster which associates 88 Świętokrzyskie Voivodeship based commercial entities. Targi Kielce is owned by the city of Kielce. The local authorities have been dedicated to economic and industrial development of the region. The investment portfolio encompasses enhancement of research and development infrastructure, modernisation of municipal and regional transport systems. The region has also seen the implementation of wide-scale schemes designed to amplify the local market's potentials as an investment area and tourist destination. Development of modern economy is also enhanced and fuelled with the Świętokrzyskie Innovativeness and Technology Transfer Centre and the entrepreneurial incubator - the Technology Park. This institution associates a few dozens of companies –they are actively involved in innovative technology and solution implementation into various business and industry sectors. The Świętokrzyskie Region's economy is mainly based on mining and construction materials production. Business sectors of metallurgy, machines, precise appliance production and food industry also play a vital role in local economy. Development of a number of Świętokrzyskie Voivodeship's industry sectors has also been fuelled by the “Starachowice” Special Economic Zone since the Zone has been a catalyst for the Province's technical potentials. The City of Kielce is also a part of the “Starachowice” Special Economic Zone (SSE). Special Economic Zones are specially designed areas in Poland which offer preferential terms for running business. According to the Minister of Economy’s SSE development plan has been designed to favour and enhance specific business sectors, i.e. precise mechanics, automotive industry, metallurgy, electronics, wood processing industry, construction materials processing, chemical industry and ceramics, food processing. The greatest number of business entities are located in the city of Kielce (27.0%) and respectively, in the districts of Kielce (11.8%), Ostrowiec (10.4%), Skarżysko (7.3%), Starachowice (6.5%), Końskie and Sandomierz (5.9%), Jędrzejów (5.6%), Busko (5.2%) and Staszów (4.7%). The smalelst number in the districts of Opatów (3.1%), Włoszczowa (2.9%), Pińczów (2.2%) and Kazimierz (1.4%). The Świętokrzyskie province boasts a high concentration of mineral-mining and rock materials processing facilities. This is where limestone is excavated and used in construction industry and cement production. In the city of Kielce there is as many an five nature reserves, including four geological reserves. The city of Kielce is located on the Silnica river in the heart of Europe's oldest mountains - the Świętokrzyskie [Holy Cross] Mountains . Not only does the metropolitan area rapidly develop in terms of its economy and business, but also education. 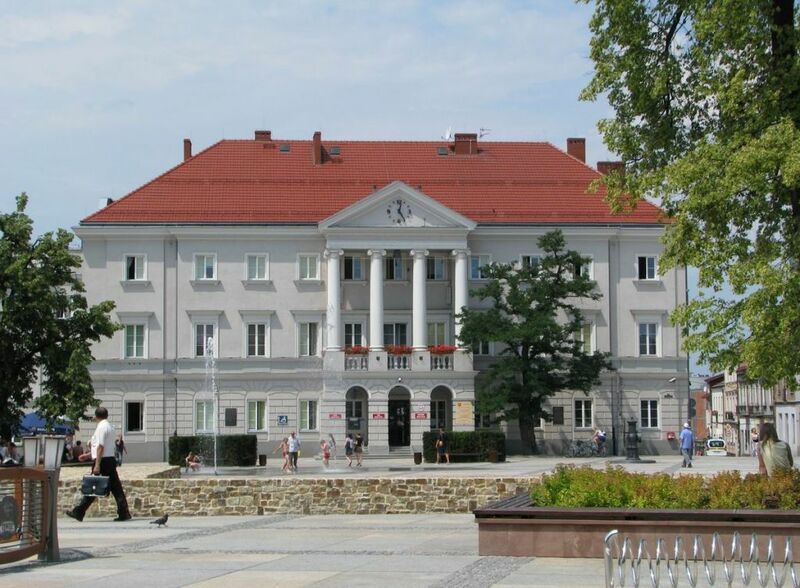 A number of higher education institutions, including Jan Kochanowski University and Kielce University of Technology are a clear proof of that. Kielce is also an important centre of cultural life. Every year Kielce hosts a whole array of events which attract thousands from all corners of the country. The city's three theatres are widely known and highly regarded in Poland and abroad. The city's cultural potential is enhanced with the activity of The Stefan Żeromski Theatre. The Theatre's spectacles have earned numerous awards of prestigious festivals. The Kielce Dance Theatre and Puppet and Actor Theatre "Kubuś" also enjoy a broad-scale recognition. The important cultural facilities of the Świętokrzyskie Region include Oskar Kolberg Philharmonic, Kielce Culture Centre and numerous museums and art galleries. Kielce's architecture is dominated with sacral and historical monuments such as the Krakow Bishops' Palace, the Kielce's oldest Church of Saint Wojciech [Adalbert] or the Cathedral Basilica of the Blessed Virgin Mary Assumption. Sienkiewicza Street is one of Kielce inhabitants' favourite places, this is also the city's main promenade. 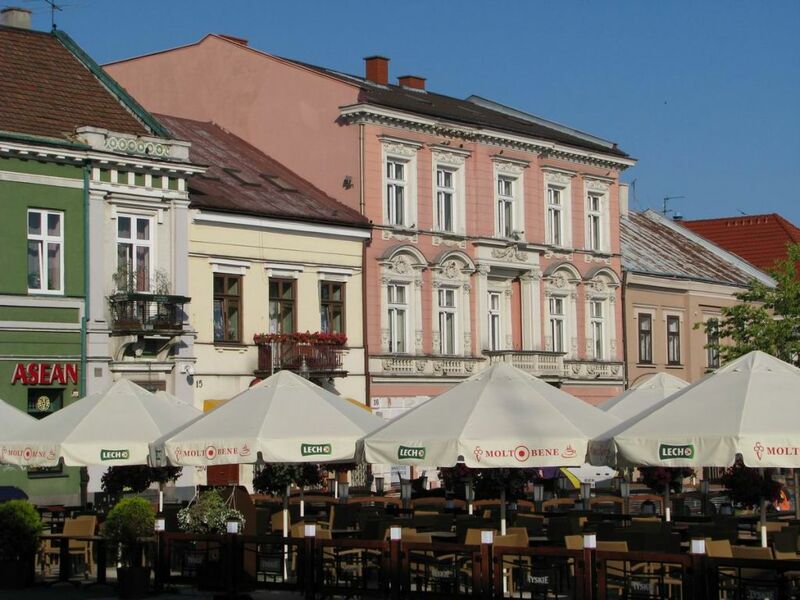 Sienkiewicza is where the historic character blends with the present-day commercial functions, this is also the city's cultural life's focal point. 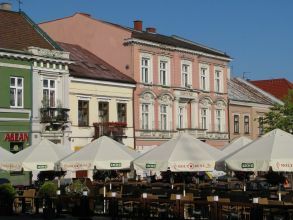 Sienkiewicza promenade has been pronounced Poland's most popular street – the winner of “Your Travels” Tourist Magazine's plebiscite. Kielce also dynamically develops as sports centre. The number of sports facilities increases every year. The city is the home for one of the most cutting-edge football stadiums, the 9 sports halls including the Legions Hall which can seat 4,200 spectators as well as the Athletics Stadium. The city also boasts most successful sports clubs - VIVE Tauron Kielce - the Polish champions handball team, the Polish Cup winner and the participant of the Champions League. The city's great advantage are rich and diversified green areas, abundance of parks, squares and scenic hiking trails and bicycle paths. Green areas are the city's flagship. The Masłów Airport in the direct vicinity of Kielce is the Świętokrzyskie Voivodeship's main airborne transport hub. The airport is available for small planes, light aircraft, helicopters etc. - a grass runway of 900 by 250 meters. Within approximately 150 km from Kielce and Świętokrzyskie Voivodeship there are 5 airports. 8 European capitals located within 700 km radius from Kielce.